In a polarized world, facts and data can provide valuable context for the debates swirling around us. And there has never been more data out there, with record numbers of data journalists working to make sense of it all. In fact, a study by the Google News Lab found that just over half of all newsrooms now have a dedicated data journalist. One of the ways we seek to support data journalists through our Google News Initiative is to work to make data easier to discover, and we’re continuing this work with a new feature on Search. Data journalism takes many forms, and it’s not always clear from the headline that there is potentially useful data within that document or story. The way that data is presented can vary as well, and though data tables are often the most useful format for data journalists, it isn’t always easy for Google Search to detect and understand tables of data to surface the most relevant results. Based on feedback from 30 of the top data journalists in the world, we identified an opportunity to improve how tabular data appears in Google Search and in doing so make it easier for all people to find the data they’re looking for. It works like this: news organizations that publish data in the form of tables can add additional structured data to make the dataset parts of the page easier to identify for use in relevant Search features. 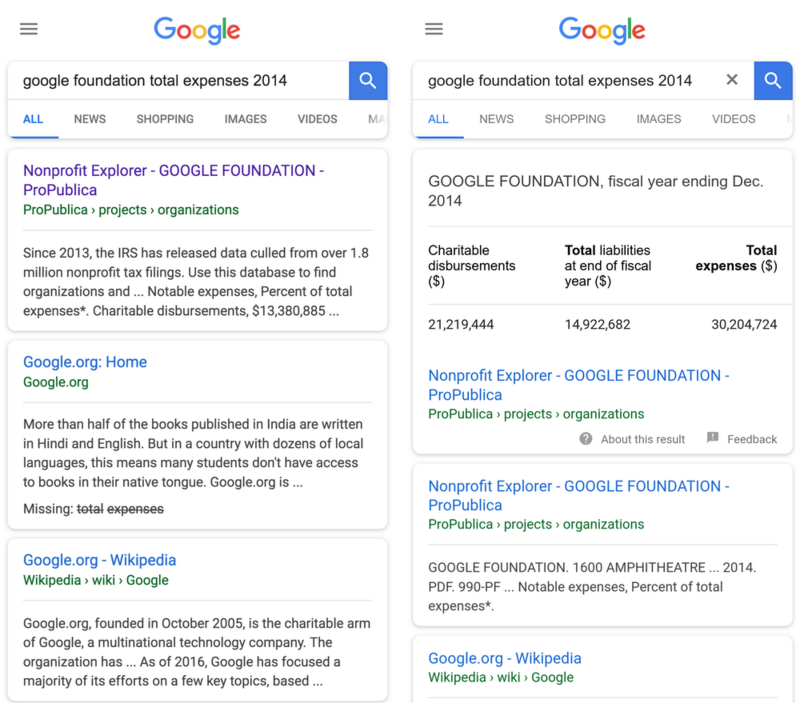 One of the participants, ProPublica has been testing the structured data on its interactive databases (for example, on its Non-profits Explorer). News organizations add the structured data to their existing html of a page, which means that news organizations can still control how their tables are presented to readers. If you’re part of a news organization, check out our developer documentation.